Cooking en papillote is a traditional French moist-heat cooking technique in which food is encased in a package of parchment paper and baked in the oven. As it cooks, steam is created within the package and this aromatic moist heat cooks the food and infuses it with flavor. The end result is a very tender dish that’s intensely flavorful because all of the juices are preserved and mingle together. It’s one of those dishes that has an elegant, dramatic presentation that’s perfect for dinner parties. You can serve the packages to your guests and cut them open at the table, watching the fragrant steam escape. Because it’s an easy dish to make, it’s equally suitable as a fun family meal for busy weeknights. Cooking en papillote is a very healthy cooking technique because it doesn’t involve cooking the food in any oil or fat. This technique works best with delicate proteins that cook quickly like fish or shellfish. If using meat like chicken, it’s best to sear it in a skillet first to get nice color and start the cooking process before proceeding. I used wild Alaskan black cod in this dish, which worked perfectly because it has a delicate, buttery texture. It’s also a lean fish that’s packed with protein and heart healthy omega three fatty acids. If you don’t have it, you can use just about any type of fish such as salmon, cod or halibut. The protein is usually cooked along with fresh vegetables and herbs. The vegetables you use should have a variety of colors and textures and should be cut very thin so that they cook in the same amount of time as the protein. Once your ingredients are assembled, start by cutting out a large piece of parchment paper and folding it in half. Then, cut out a heart shape. Place a pile of vegetables on one half of the parchment and place the fish or other protein on top. Spoon a small amount of liquid on top to create steam. Wine, soy sauce, and chicken stock are just a few examples. Then starting at one end, fold the edges of the parchment over to form a sealed package. Overlap the folds as you go to create a tight seal. If you don’t have parchment paper, you can use aluminum foil. Do not use wax paper as it will burn at high temperatures and leak. Once your packages are sealed, place them on a baking sheet and bake in a hot oven. As they cook, the parchment will puff up as steam is created. Aluminum foil will create a tighter seal but won’t make as attractive a presentation as it won’t puff up like the parchment. With aluminum foil though, you can open a package to check if the food is done- with parchment, you can’t peak inside. Once you remove the packages from the oven, transfer them to a plate and cut them open in front of your guests to release a burst of fragrant steam. 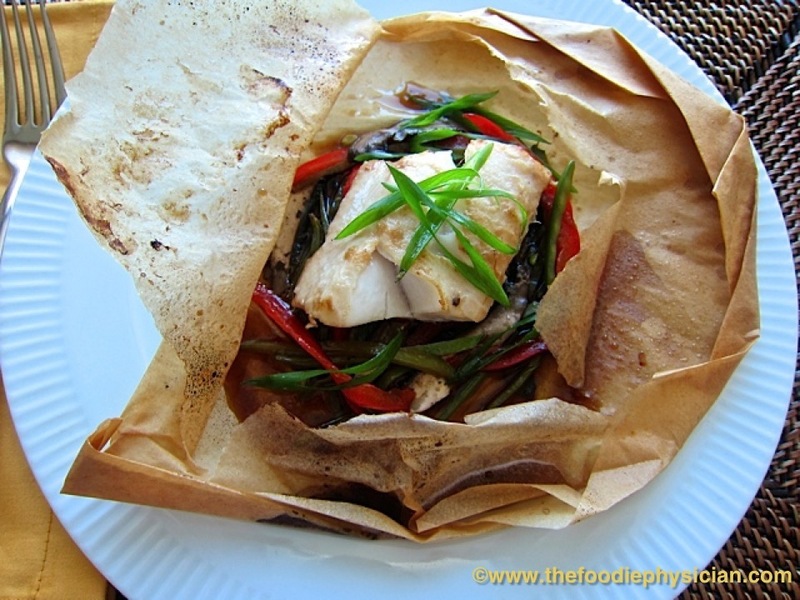 My Asian Black Cod en Papillote is a delicious and light dish that incorporates Asian flavors. The fish and vegetables are lightly topped with a sauce made with Shaoxing wine, soy sauce, ginger, honey and sesame oil. Shaoxing wine is a rice wine commonly used in Chinese cooking. You can use dry sherry if you don’t have it. Use just enough sauce to add delicious flavor to the dish without overwhelming the delicate, sweet flavor of the black cod. Have fun and experiment with different ingredients and flavor combinations. It doesn’t have to be fancy-just combine your favorite seafood or meat, some vegetables, a few sprigs of fresh herbs and a splash of liquid. The possibilities are endless! To make the sauce, mix the wine, soy sauce, ginger, honey and sesame oil together in a small bowl. Set aside. Cut 4 rectangular pieces of parchment paper large enough to hold the pieces of fish. Fold each piece of parchment in half and cut the parchment into a heart shape. Open the parchment up and place ¼ of the bell pepper, snow peas and mushrooms on one half of each piece. Sprinkle each pile of vegetables with about 1 teaspoon of the sauce. Place a piece of black cod on top of each pile of vegetables. Spoon the remaining sauce over the fish. Fold the top half of the parchment over the fish. Starting at one end, fold the edges of the parchment, overlapping the folds to seal the open edge completely. Place the packages on one or two baking sheets. If you don’t have parchment paper, you can use aluminum foil instead. Bake in the oven for 10 minutes, until the parchment paper puffs up and the fish is just cooked through. Transfer the parchment packages to plates. Carefully cut the packages open, being careful of the steam. Garnish the fish with scallions and serve immediately. I have to look out for Asian Black Cod in my fishery. It looks so meaty and healthy, yet light.Sounds very fast and easy cooking.